Combining the fun of Bingo and Tic Tac Toe! 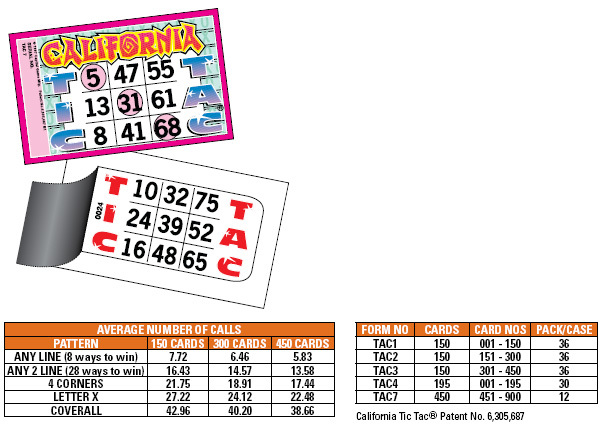 California Tic Tac is a 9 number concealed bingo ticket that will create extra profits for your game. With only 9 numbers, California Tic Tac is great for early birds, intermission games, or any time you want a fast and fun game. You set the ticket price, pick the game pattern (see the table below for suggestions), and determine your profit. For example: Charge $1.00 per ticket; sell all 150 tickets in the deal; and then play California Tic Tac for a $100. You’ll add an extra $50 to your profits. Each set of tickets has a unique serial number and is offered in 6 different tag colours (red, blue, green, orange, purple & black), so you can play several times in your session.California Tic Tac is available in 5 unique series that can be played alone or combined.